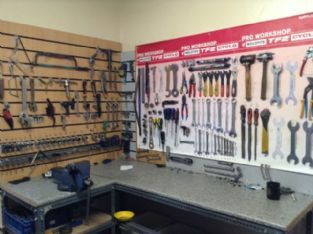 Gainsborough Cycles has a well equipped workshop and is able to carry out cycle repairs and servicing. All repairs are recorded on a job card, a copy of the job card is given to the customer. Where possible cycle frame numbers are recorded on the cycle repair job card. All cycles are inspected on arrival in the shop, the required work is discussed with the customer and an estimated cost is given, before the cycle is booked in for repair. If it is practical all cycles are test ridden after work has been carried out on a cycle. All repairs are fully quality Inspected, any problems are reported to the owner of the cycle. Labour charges are priced as to the work required to be done on the cycle. All parts are supplied at shop floor prices. Gainsborough Cycles can refuse to work on any cycle in too poor condition or not economic to repair, also equipment that is too complicated to handled in our workshop. If we are unable to do the work required we will do are best to recommend some one who would by able to help. Very small jobs examples, tyre & tube fitting loose wheels, pumping up of tyres, fitting of some basic parts, a quick cycle inspection and safety checks are done free of labour charge. These jobs are done at the discretion of the cycle mechanic or shop assistant. Routine small jobs examples, tyre & tube fitting, gear or brake adjustment, wheel truing and chain repairs also the fitting of accessories. Routine service, this covers a full inspection of the cycle, lubrication, gears & brakes adjusted, headset adjustment, bottom bracket adjustment, cones adjusted, and the cycle checked for loose worn & damaged parts. Full service, the cycle is stripped down as required, components all cleaned, inspected, serviced and lubricated as required, wheels, rims, tyres & tubes checked, frame cleaned & inspected, the cycle is reassembled and checked for loose worn & damaged parts. 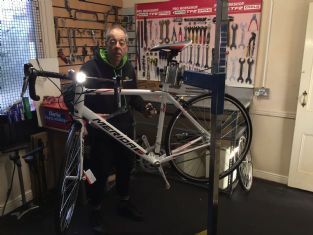 Trevor Halstead (Pictured Above) has been repairing cycles since 1977. He started out as a village Cycle mechanic, then helped out in a cycle shop before taking over Gainsborough Cycle Centre and renaming it Church Street Cycles in October 1998. In 2014 the shop relocated to 20 Ropery Road, renaming the shop Gainsborough Cycles.